Driven by the mission to “Help Parents Raise Good People,” The Mother Company is launching their second childrenʼs program, Ruby’s Studio: The Friendship Show. This new episode in the award-winning Rubyʼs Studio series features adorable live-action host, Ruby, who leads young viewers (ages 2-7) on an engaging adventure through fun animated sequences, art projects and original music, all geared toward helping kids to resolve conflict and show empathy, kindness and loyalty toward their peers. “Our experiences in the world are shaped by how we connect to other people. From early childhood, few things are as crucial as successfully making and keeping friends. We want to help young children navigate that experience,” says Abbie Schiller, CEO and Founder of The Mother Company. 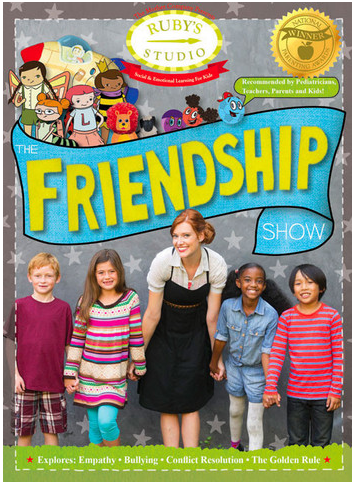 “The ability to make and nurture long-lasting friendships is not inborn but rather a multi-faceted skill that children must learn; Rubyʼs Studio: The Friendship Show offers essential tools to boost social skills and give kids a leg up toward building successful relationships throughout life,” says Samantha Kurtzman-Counter, TMC President. 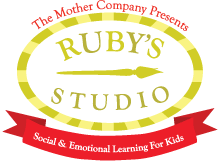 You can download Ruby’s Studio: The Friendship Show now at the Mother Company’s website. Pre-orders of the DVD at $16.99 will ship 12/14/2012, or you can download the digital version for $11.99 now. Upcoming episodes include Ruby’s Studio: The Safety Show and Ruby’s Studio: The Siblings Show, both set for release in 2013.